Please note: This content has not been fully reviewed and may not be accurate. Please contact one of our stores for more information. Perfect for your outdoor space, porch or patio. The South Beach 3 piece Pub Dining set from RC Willey is sure to transform the way you enjoy your yard. Perfect for a quiet breakfast or a relaxing drink, this set come with 2 matching minimal bar stool height chairs and a square pub table. Bring it home today! 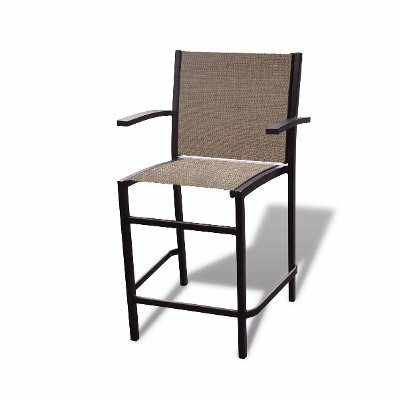 With a minimal design and classic woven sling construction, this 24" Outdoor Patio Bistro Pub Chair from RC Willey is the perfect place to sit back and relax this summer. Buy a few for a perfect chat set, or an extra for the matching South Beach Pub Table. 3 Piece Outdoor Dining Bistro Set - South Beach is rated 3.5 out of 5 by 2. Rated 2 out of 5 by NinJenn Not terrible, but okay for the price It came with missing bolts and one of the end caps broke the first time the chair was used. We had to construct something ourselves to ensure our 1 year old didn't hurt herself on it. Rated 5 out of 5 by 208Nikki Perfect for a Small Patio and a Party of Two. We live in an apartment and this set fits our smaller balcony perfectly. We have looked at several places for tables and this is by far the best deal we found. The quality is great and it took less than 10 minutes to put the table together. The table is pretty small, its more for sitting around playing cards or having a drink, not really ideal for eating at if you have more than one person at the table.